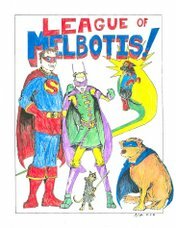 League of Melbotis: Lost my edge. Completely. I think you're sort of a charming combination of the two. Think Mr. Rogers carving his name into his own chest. 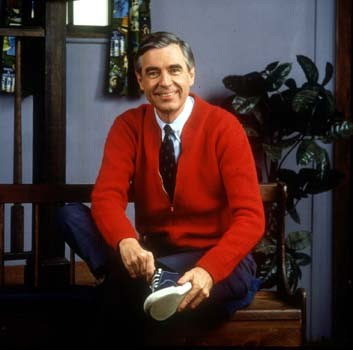 But that Fred Rogers always did have great sweaters and tennis shoes.....there's something to be said for good outerwear and foot wear. :)Nothing wrong with being a 'glass is half full' kind of guy either. Thanks, team! I appreciate the vote of confidence. Welcome to my world. Join the eternal swirling void of happiness! Muah ha ha ha ha! What the hell? Please go and beat on your chest and maybe punch someone. Otherwise the vortex of happiness (crappiness) will have claimed another victim! Denise, at your urging, I went to the old folks' home and sucker punched, like, four grannies. No falling suburban malaise for me! 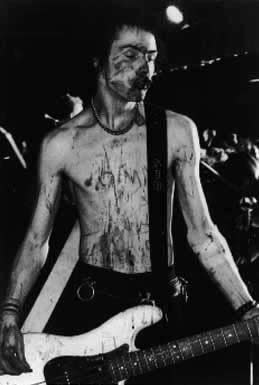 Hey, as a self-destructive bass player, I'm voting for more Sid. And, you know, doggie photos are great too. I should really make an effort to take more photos. Also, to fall into a tragic love affair from which neither of us escape alive.